News coming out of Syria is not good. Syria’s dictatorial leadership has oppressed the people of Syria and tried to keep them uninformed about world events. My only visit throughout the country of Syria was in May, 2002, when a teaching colleague and I spent a week in the country driving to most of the major cities and historical sites. We drove along the Mediterranean coast from south to north in order to visit Ras Shamra (Ugarit), significant because of what the site revealed about Canaanite culture. This means that we needed to spend the night at Latakia, about 6 or 7 miles south of Ugarit. We stayed at the nice LeMeridien seaside hotel. Internet use was difficult. I recall dialing long distance from the Commodore Hotel in Damascus to Beirut in order to have dial-up service to AOL. We had set up AOL and Excite accounts, having heard that some hotels would allow one, and some another. AOL generally was not allowed in the country. I have a copy of the short Email we sent home from Latakia. Today we go to Ebla and on to Aleppo. We are unable to check our mail here. Access to AOL and Excite are prohibited on this server, but the hotel staff was kind to allow us to use one of the office computers. So we can at least let you know we are fine. Hope to have some mail from you when we arrive in Aleppo. Hotel personnel are helpful and friendly. I am not able to go to AOL or Excite to get mail. A backroom manager-type allowed me to use the hotel email to write. Latakia is not named in the Bible, but the city is important in wider biblical history. In 1967 I purchased a copy of The Middle East, one of the Hachette World Guides, published in 1966. Here are a few facts garnered from that book. Latakia became part of the Assyria empire during the 9th century B.C. In 604 B.C. Latakia was controlled by the Babylonians. The town became part of the 5th Persian satrapy. After the Battle of Issus (333 B.C.) Alexander conquered the city. Seleucus I named the city Laodicea in honor of his mother. The city later came under Roman, Byzantine, Islamic, Crusader, again Islamic, French, modern Syria, etc. 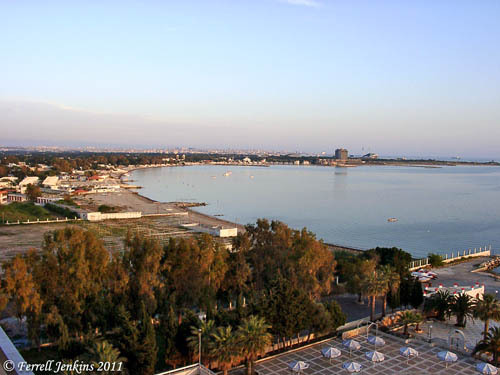 This late afternoon photo shows the harbor on the north side of Latakia. This is probably not more than 30 miles south of the Syria-Turkey border. Harbor north of Latakia, Syria. Photo by Ferrell Jenkins. 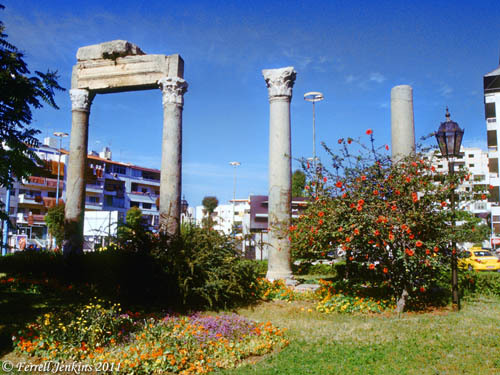 Surviving columns may be from the temple of Adonis. Photo by Ferrell Jenkins. It would not be out of place to suggest that Paul (Saul) sailed by Latakia (Laodicea) when he went from Caesarea to Tarsus (Acts 9:30), and when he sailed from Caesarea to Rome (Acts 27:3-5). Perhaps Barnabas and Saul traveled this way when they took the financial aid from Antioch to Judea (Acts 11:29-30). This entry was posted in Archaeology, Bible Study, Culture, Photography, Travel and tagged Syria. Bookmark the permalink. Farrell- Do you have any photographs of the area where the Battle of Issus took place between Alexander the Great and Darius III? Trying to visualize the battlefield. Many thanks!